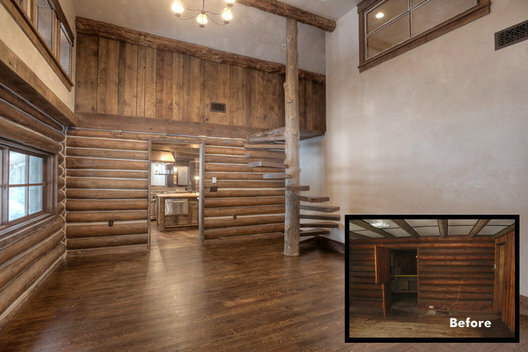 The original 1920's cabin had log walls and river rock from a nearby stream. In 1960, a wing was added. Though large, the home was delapidated, dark and dirty. 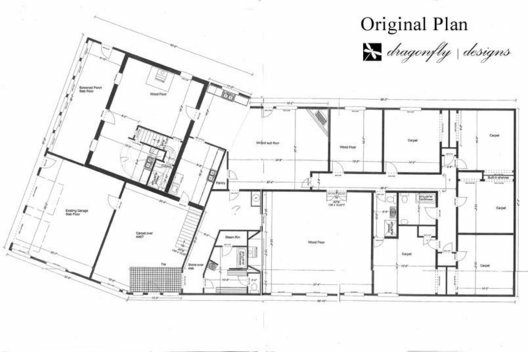 With minimal demo, we revised the floor plan to sleep 20 and allow the most current lodge spaces such as a theater, bar, bunk room, two master suites an multiple seating spaces. 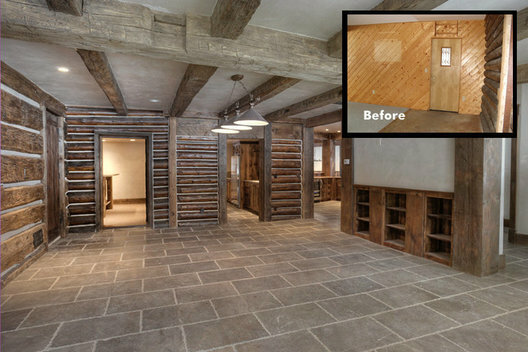 Originally two garage doors, this elevation was turned into a double garage space with a workshop under the third door. 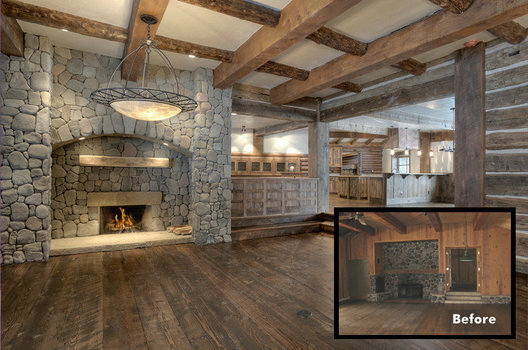 A balcony was installed above for light and access to the clean mountain air from the upper master suite. 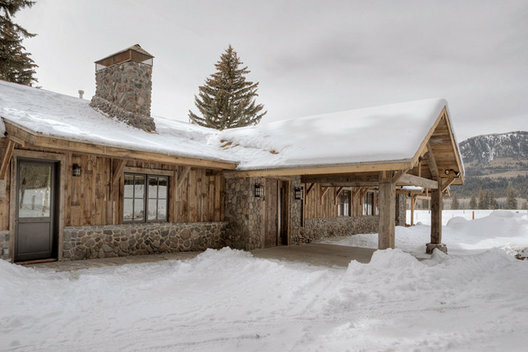 The porte cochere allows a dry entry to the Foyer or Mud Room. 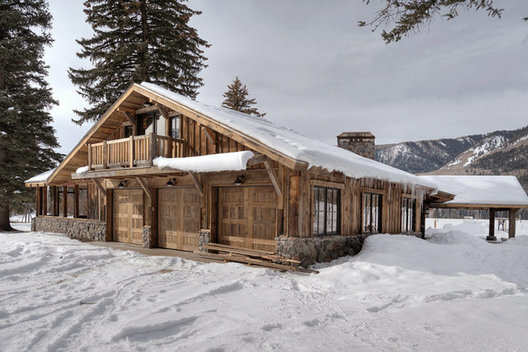 Set in a stunning valley with acres of grasslands, rivers and mountains in all directions. 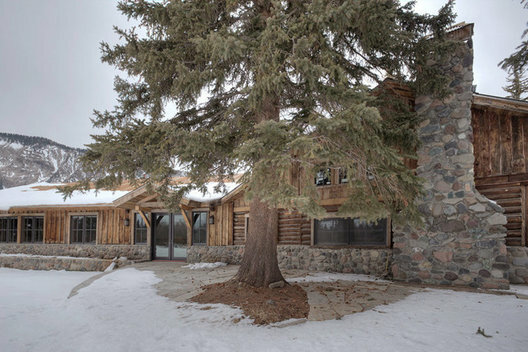 A 100 yr. old pine tree stands peacefully tall against the original riverstone exterior chimney. 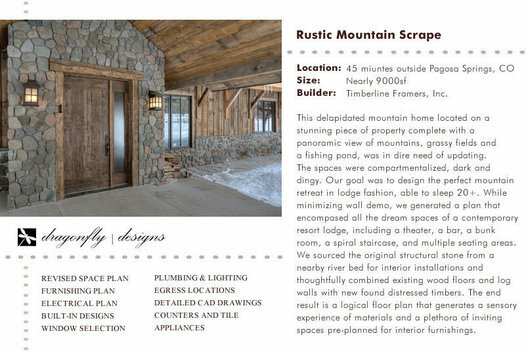 The charm of a cabin and rustic home set in a panorama of mountain views. 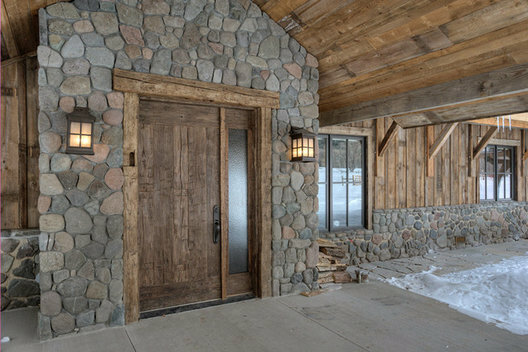 The front entry under a massive porte cochere protects in harsh mountain winters. River rock from the nearby stream adorne the walls. A alabaster bowl light was the solution to the low mounting height in what will be the fireplace seating area. Diffuse and warm light will bathe the area, while task lighting in the form of floor lamps will be on side tables. The corner of this room was made into a game tabe space, with a Curry and Co. chandelier. 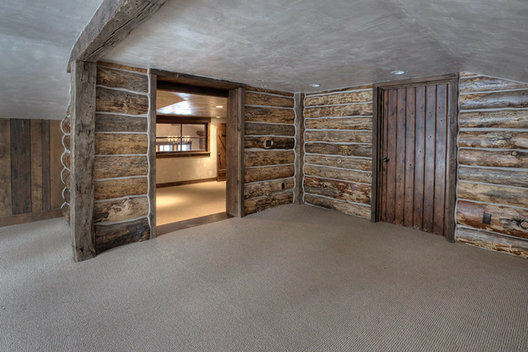 We opened the log wall for a view from the study to the main entry. 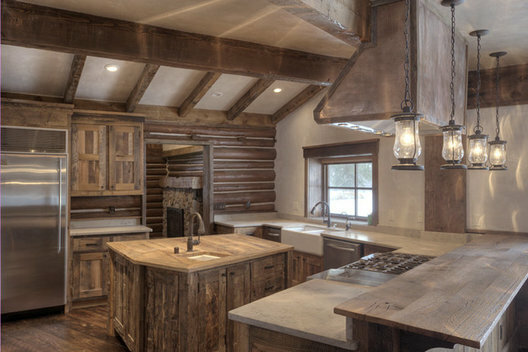 This charming and cozy kitchen embraces function, state of the art appliances in with the warmth of wood and lantern lights. 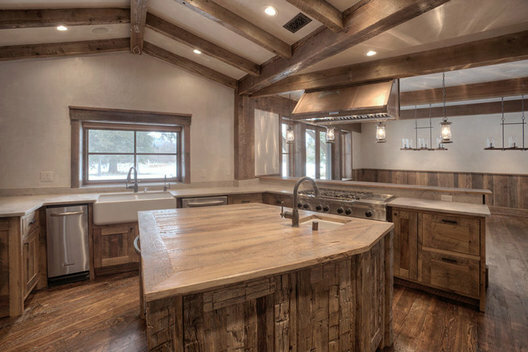 Honed limestone counters, a patinaed copper hood, lantern bar lights and a reclaimed oak counter on the island create a sensory experience of rustic materials. The original structural window resides above the kitchen apron sink. 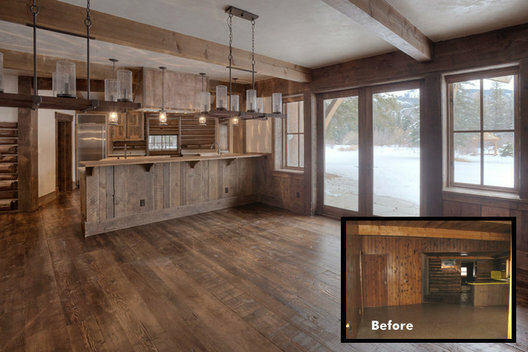 A wood wainscot made of reclaimed pine barn siding warms the dining space. Mirrored chandeliers made of wood and iron brighten a space made for a 10' dining table. 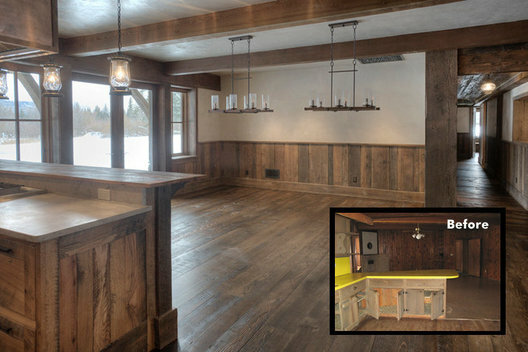 A beverage cooler, white wine cooler, ice maker and sink complete this bar space. The wall opposite the bar is wired for a TV, should there be a winning game on. 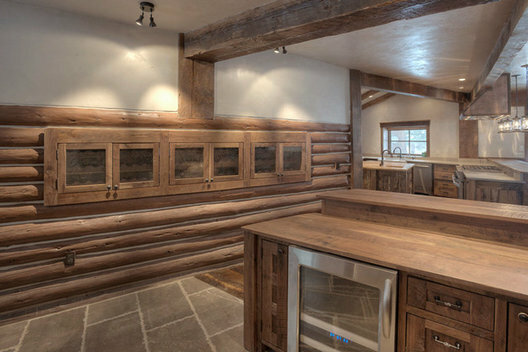 The wine cabinet in this hallway bordering the bar is an original window opening to the 1920's cabin wall. 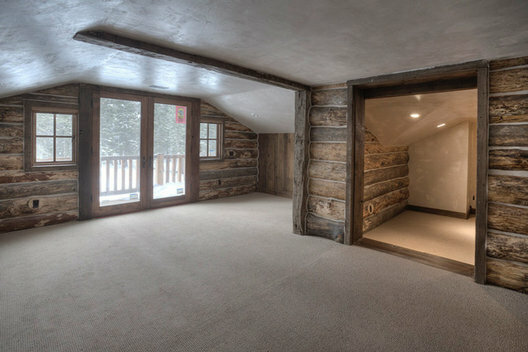 It is a nice conversion and conveniently placed. 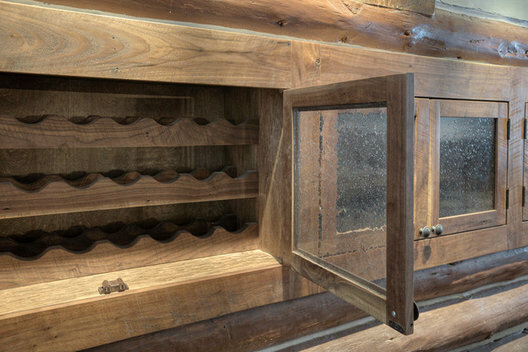 This custom wine storage cabinet features a 400 bottle maximun and glass doors to keep dust out. Seeded glass add to the old cabin look. 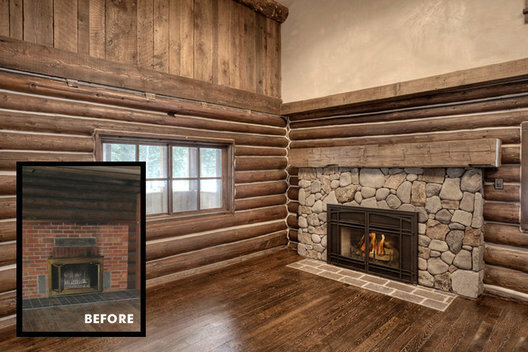 Once dark, black and plain ugly, this fireplace got a face lift (and the room got a ceiling lift!) What a cozy space now. 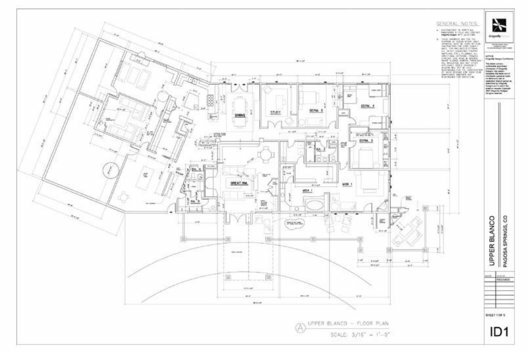 Once a room with 8' ceilings, this space now hosts a spiral staircase to the upper master suite and 16' ceilings. 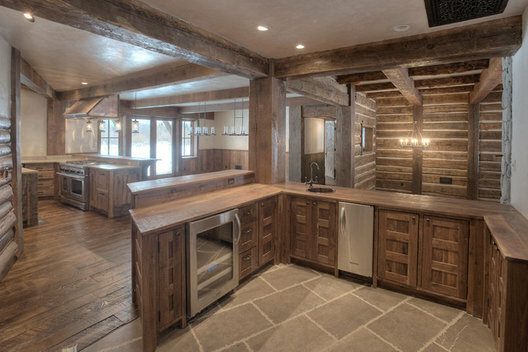 A combination of old and new distressed wood give character and an ecclectic collection of rustic materials. 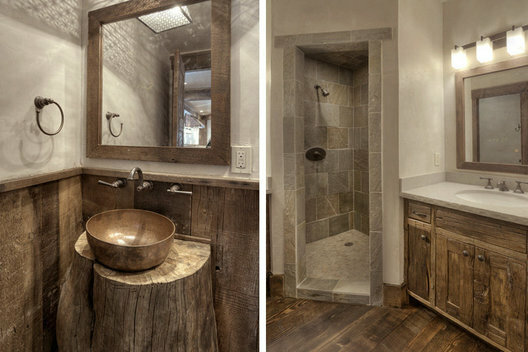 These rustic bathrooms feature a patinaed copper sink, stone and rustic cabinets. We nestled this theater space between the kitchen sitting room and the Game room. State of the art projector technology was installed as well as a bartop for sports and beer fans who want a full game experience. 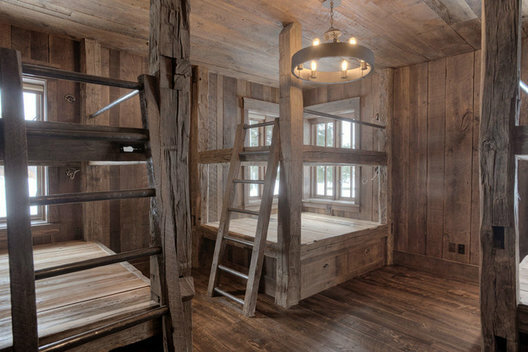 Capable of sleeping 10, the double bunks capture the corners of the rooms. Conveniently, the windows were placed so the first view of morning could take place from bed. An iron chandelier with fun edison bulbs is a focal point in the center of the room. With the possibility of sleeping so many people, this house needed a bathroom space capable of multiple handwashes at one time! 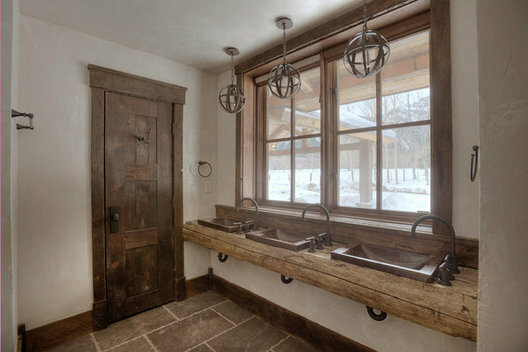 Three sinks looking out to the wildlife and mountain views is highlighted by orbital wooden pendant lights above. 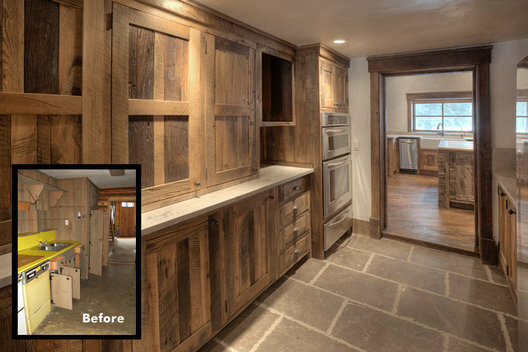 A rustic wooden slab counter adds that unique "chunk" to the space. 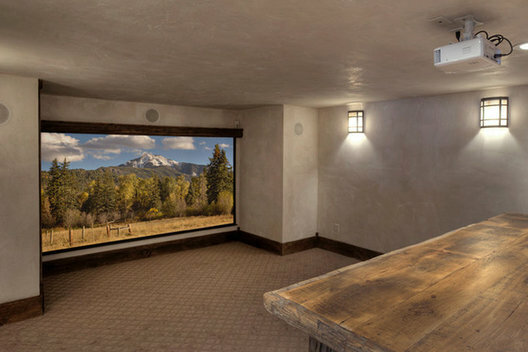 Perfect for a pool table, a wall mounted tv for the game and adjacent to the bar and theater, this Game Room is mountain luxury. 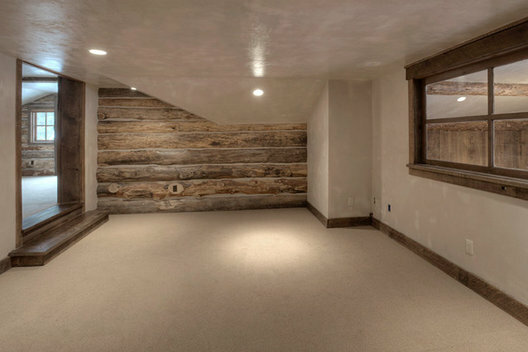 Logged accent walls throughout the entire home add warmth and are consistent with the Pagosa Springs setting. 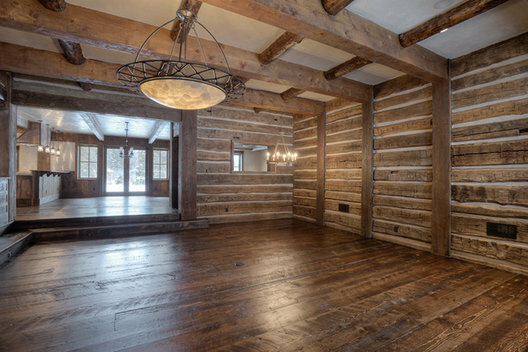 In this space, we used an window from the original structure to open the room to the sitting room below. 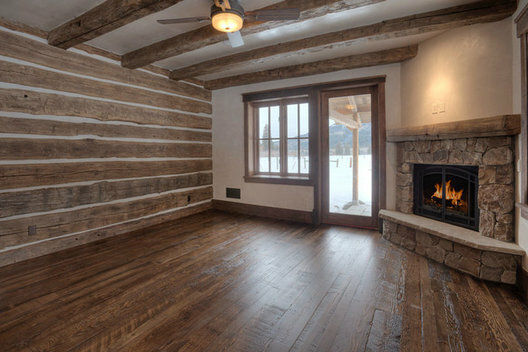 Log walls, looped wool berber carpet and distressed beams are the envelope to a gem of a space we created from a dingy attic. The original staircase to this level is where the shower is. With some creative plumbing, we were able to incorporate a luxury bath, a full steam shower and two sinks with linnen storage. 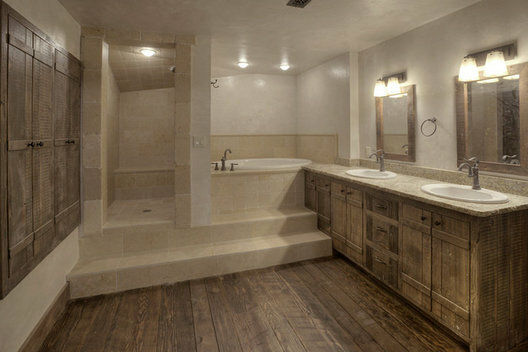 Gold travertine in s simple pattern allows for a variety of decorative styles. 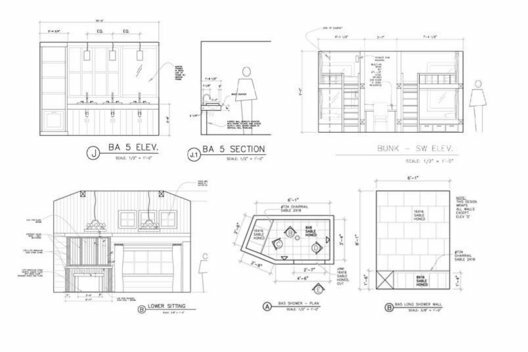 Dragonfly Designs provides detailed and dimensioned CAD drawing design sets for communication of finishes, floor plans, furnishing plans and electrical plans.